Rose rosette is a fairly common disease of roses that can cause significant damage. 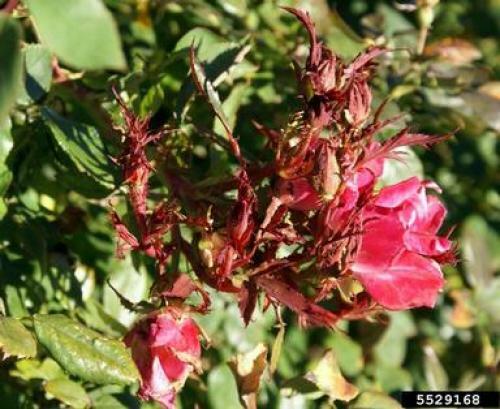 Although more commonly known on weedy multiflora roses, we have received several samples of cultivated roses showing symptoms typical of this disease. Symptoms of rose rosette can vary greatly but typically include rapid growth of shoots, "witches' brooms" (tufts of branches growing close together), development of tufts of small, deformed, reddish leaves, and excessive thorniness. Affected plants typically decline over time and eventually die within one or two years. The deformation of leaves caused by rose rosette can be similar to the results of herbicide injury. The Iowa State University Plant & Insect Diagnostic Clinic can help you to investigate rose diseases. Curently in the clinic, we do not test for Rose rosette, but we can redirect you to a clinic that does perform the test. Contact us, Plant & Insect Diagnostic Clinic at our contact page. Unfortunately, a rose plant with rose rosette cannot be cured. Infected plants should be removed to prevent a spread of the disease in the landscape. My 'Spring Snow' crabapple bloomed beautifully this spring, but has recently begun to lose many of its leaves. Why? It's mid-May, but my rose-of-sharon hasn't leafed out yet. Is it dead?